kiki creates: the duvet:a quick tutorial.. and a little Q & A.
the duvet:a quick tutorial.. and a little Q & A.
Alrighty folks..shall we get down to the nitty gritty about the duvet cover? Here it is again, next to the inspiration piece from Urban Outfitters. *2- King size flat sheets. *thrifted bedskirts, sheets and tablecloth. 1. I washed and bleached my thrifted items to make sure they were super clean before I started sewing. You can also wash and dry your sheet set. 2. Sew right sides of sheet set on 2 sides together. I used the nice top as the top of my duvet cover. When both sides are sewed, turn it right side out and place your comforter in the duvet cover. I was making a queen size duvet cover so I had to cut down the sheet set. I simply used a light washable marker (yellow) to make ﻿my line where it was good to sew and cut. Remember to leave your seam allowance as well! Take your comforter out, turn it right sides together again. Finish your edges on the side you cut, then sew together. (Note: I also realized when I was sewing the ruffles, that it would have been easier to sew this all together at the end..either way will work, but the ruffles are very hard to sew when the duvet cover is sewn together...believe me, I did it! ):)..so feel free to measure it all, then do the ruffles and sew them on, then come back and sew the finished top together! 3. Make a million ruffles! I know, really exact with my counting, huh?! I feel bad I wasn't so exact with all my measurements and numbers..I did have a whole lot to finish in 3 days! :) I made 3 different types of ruffles: 1. I cut 9" strips of fabric and sewed tubes, turned them right side out and ruffled them. 2. I cut 5" strips of fabric, finished the unfinished edges and sewed them straight down the middle, ruffling along the way, then sewed on either side of the middle line ruffling as well. 3. I cut 4" strips of fabric, finished the unfinished edges, and sewed down the middle, ruffling along the way. 6. Make your duvet cover closeable by adding button holes and buttons at the top, or sew ribbons at the top to close the top up! 7. Really that is all there was to it! 1. Do you have to have a fancy machine or ruffler foot for your machine? NO! I did this whole project on my basic machine..so I know ANYONE can do it on any machine. I love how my straight stitch is on my machine, thus why I used this one! I also love the uniqueness of the ruffles by doing them by hand. 2.Where did the inspiration for your bedskirt come from? This may seem a bit strange, but it came from a girl who makes customized wedding dresses. Her site is HERE. Check out the bottom of that dress..isn't it amazing. Totally wanted that look for the bed skirt. 3. Where did I get my lamps? 4. What is the color of my room? I am renting right now, but they had an extra bucket of paint outside. It is Swiss Coffee by Glidden. It really is a nice nuetral color! Thanks for stopping by. Let me know if you have any other questions! EDITED: FIND THE RUFFLE HOW-TO HERE! Oh WOW!!!! I love your duvet cover and have been after something similar for quite some time now...who would of thought it would be fairly easy to make one. It's now on my to-do list!!! Incredible job! Your hard work, paied off - it's just beautiful! Also, thanks for sharing where you picked up your lamps! This is so beautiful! Thanks for the user-friendly tutorial, I am going to give this a try. I actually looked at that UO duvet when I was shopping for mine but it was way out of my price range. I LOVE yours - and it's just more motivation for me to get a good sewing machine! It's beautiful! I just dropped bucks for mine, wish I'd seen this before, I would have made my own! Absolutely gorgeous! Wow! It turned out beautifully! How beautiful!!! I love love love it! You are amazing! I love this. I wish I knew how to sew. I would copy it in a heart beat. Thanks for sharing. Featured on my blog - this is amazing! I LOVE this! I found your blog on Tatertots and Jello and can't get over this duvet cover. I think I just got my guest room inspiration! I've been on the hunt for a good tut on something like this...gonna make a set for my daughters room and finding yours was like hitting the JACKPOT...DING DING DING DING. Thank you for sharing - it looks so do-able! I love the little pillow with the heart on it. Am I missing where the info is on that pillow? i can't tell you enough how awesome this is! AMAZING job! i've been wanting the u.o. one forever! but don't want to pay that price. this i can totally do! Thank you so much! I love it! How did you make your head board? Do you possibly have a tutorial on that? I absolutely LOVE this! Any tips for someone wanting to do the same thing, but for a king? Do you think king sized sheets would still be big enough? This is so beautiful! I have added it to my list of inspirations. Thanks! this is so awesome! so beautiful! i definitely want to make one for my daughter and maybe even one for my bed too! i was wondering, is this tutorial for a queen-sized duvet. i know you said you bought king sized flat sheets, i'm sorry if you posted the information elsewhere and i missed it! I love this! I want to make one but I'm new to sewing and I have a California King Sized Bed. What size sheets would I need? Sorry! The above comment about what size sheets for a California King Bed was me, accidentally signed into my husband's account! so beautiful I could cry! I have been wondering how to zhush up our king-sized bed and now I know. Oh Em Gee. Adorable. Good work ! Gorgeous!! I just did a similar thing and made my daughter a duvet like the Cirrus duvet from Anthropologie. Love the ruffles! that I loved and was wondering how to emulate it, and now you have given us this beautiful inspiration. Thanks so much! What an amazing duvet cover!! You surely deserve a pat on the back! Great work. Gorgeous! Great tutorial too, I linked it to my project: bedding post too, it's all good! I loove it and love a great sewing project. thanks for inspiring me with your fabulous blog i am now a follower! Over here from Life Your Way. This is SO cute and you make it look SO easy! My little girl is almost 3 and this would be perfect in pink! Thanks for sharing! about how long was your longest ruffle? I love this idea and my daughter just emailed your tutorial to me asking me if I could make it. And, just to be clear, you just made the ruffles with a regular sewing machine with a basting stitch to ruffle the strips? Thanks so much! i NEED to learn how to sew!! I have a plain white duvet that I bought and I want to dress it up. I'm thinking about ruffles, but I don't know if I can do it. I LOVE yours! I absolutely love this. I am seventeen and looking for something exactly like this for my dOrm room next year. And I think i can do it! Can you please please please email me on how to do the ruffles, and any tips you have to do a twin size! My email is Halsey_Brooks@hotmail.com thank you!!! Perfect! This pattern must be added to my duvet cover selection. Perfect! This pattern should be added to my personal duvet cover selection. Hi I am wondering are interested in making one that I could purchase? Just wondering if you are interested in making a twin sized one to sell? Will you e-mail me? Thanks!!! took me about 2 weeks to finish it (I just got back in to sewing again) but it was fun making it! Hello, Thank you for the post!! Q: What do you mean "finish the edges" of ruffles? I want to make this but worry the ruffles will fray. What is it you do to make sure the ruffles do not fray? 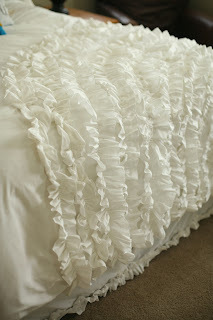 Have you seen www.rufflefabric.com? I ordered some material from there for a photoshoot- - but it just might work for this project too. ? Just thought I'd pass on that site in case you or someone else might want the look without quite as much effort in making the ruffles! lol. (that would be me.) Thanks for a great tutorial. Say I really wanted one of these in a twin size but I had absolutely no time or the skills to do this. Would you ever considering making and selling these at a reasonable price? I love yours! It's now clearanced on UO but they don't have king size (the size I need) in white anymore. But you have inspired me, I can totally make that! You didn't REALLY sew the sheets together before you started the ruffles, did you? This may be a silly question, but how did you so the ruffles on the duvet? Did you hand sew them or use the machine? I absolutely love this white duvet cover BUT with my husband it would never stay white. I would like to mix several colors randomly but do not know how that would look. Could you advise me on how to do this? I've been sewing for over 40 years so I don't think it would be too hard - it is the creative part that I get hung up on !!! I've had this project bookmarked for some time, just waiting for a chance to do it. My little girl (7) just moved into her own room and we're going to make this for her new bed, except the ruffles will end up looking like a rainbow. So excited! Thanks for the inspiration!! I love this! I'm crazy about ruffles! Hi! I'd like to feature this on SewCanShe.com. Please drop me a line to let me know if that's okay. caroline@sewcanshe.com. I just purchased some mint green sheets to do this project! Thank you so much because I had seen this online for a lot of $$$ that I dont have.lol I hope to do the back of the duvet white and the top with the green and white ruffles for some contrast! Ill send a link when I finish!! Thanks!